I am often asked why I use models, as it adds time and expense. My response is to ask, how could you sculpt a convincing statue without working with a model? If you want your sculpture to breathe life, you need a living breathing model by your side throughout the process. What do I look for in a model? Someone who has a physical rather than facial resemblance to my subject, in this case Emmeline Pankhurst. Of course you can never get anyone exactly the same proportions and age, so you are always adapting. I will also be spending months in the studio with them, so having someone whose company I enjoy is a real bonus – and in Sarah Jenkins I had a fellow feminist, a professional model and someone to bring laughter to the room. And she was the model for the little Our Emmeline maquette. For the Our Emmeline statue, I was quite clear what I wanted her to wear: elegant clothing with simple lines. From research I know that Emmeline considered the Suffragettes should be the best-dressed women in any room – a way to disarm critics. But with historical female figures it is too easy to make it all about the clothes, diluting the overall message of the statue. I want to convey Emmeline’s vitality, courage, dignity, and beauty, while capturing some of her driven and uncompromising nature, essential in transforming the establishment. The clothing has to support this message. 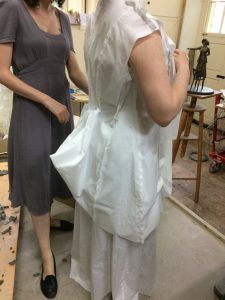 Rosie Talbot, a specialist in period costume, reviewed the dress and jacket I had designed for the maquette and made them to fit Sarah. Of course, underneath it was essential for Sarah to wear the dreaded corset. In the heat of the summer of 2018 she managed to survive wearing the corset, dress and jacket each day. I can never thank you enough Sarah.